An activist group is urging the city to halt its plans in redeveloping Fredericton's Officers' Square. Activists are considering their legal options if the City of Fredericton doesn't halt the redevelopment of Officers' Square and go back to the drawing board. "We're totally hoping we don't have to take that avenue, but if the City of Fredericton, the mayor and the councillors are not willing to listen to the outcry from the general public, we will have no choice," said Beth Biggs of Save Officers' Square. 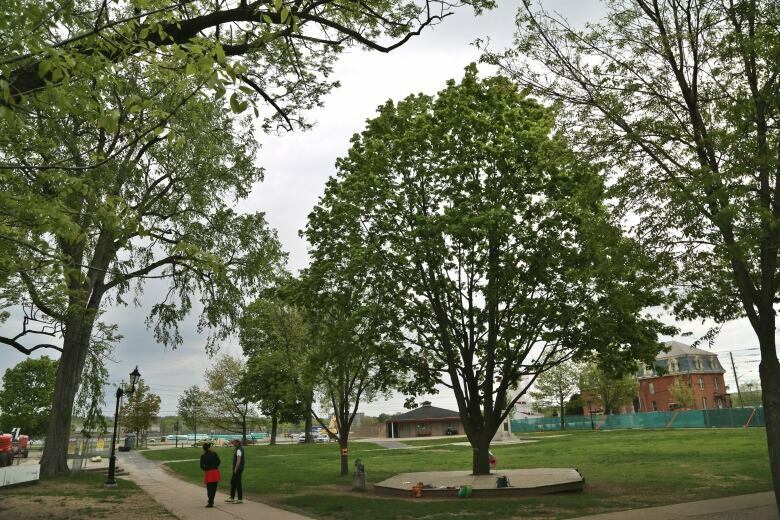 The group was formed after the city announced it would be cutting 19 trees in the downtown square to revitalize the historic area in the next four years and widen nearby St. Anne's Point Boulevard. The project includes a permanent concert stage and skating oval on the square. "It could be a long battle," Biggs said. "We're going to save every single stone, every single leaf that we can, every single bird nest that we can." The group held a news conference at the Garrison Room of the Crowne Plaza Hotel on Friday morning, with questions taken by a panel consisting of Biggs, forester Chris Smissaert, Rachael Quackenbush and Marie Perley, the acting co-chair of the Maliseet Advisory Committee on Archeology. More than 50 supporters attended. Members of the public "feel it's a vanity project," Biggs said. "People get into a place of power and want to transform and leave their mark. Don't leave your mark on a national historic site. Don't destroy Canada's heritage." Officers' Square is technically the birthplace of the Canadian army, according to historians. The Royal Canadian Regiment was formed there on Dec. 2, 1883, but the site had a British military presence starting in 1785. How old are the Officers' Square elms? The city of Fredericton will have a consultation session with the public on June 26. Wayne Knorr, communications manager with the city said on Friday staff and the city are currently reviewing all plans to determine "what modifications to the plans, if any, are possible in regards to removing the trees and / or the number of trees." "We will also wait to hear public feedback at the special Development Committee meeting next Tuesday before determining what modifications might be possible," he said in a statement. Chris Durrant, a lawyer at Lamrock's Law who has been advising the group on a pro bono basis, said he made right-to-information requests of the government to understand the timeline of the project. Durrant said he wanted to know when the minister of heritage granted provincial heritage permits for the city to make changes to the square. "The most interesting thing about the permits I received through the right-to-information system was that the city had only gotten permits to make changes to the side of Officers' Square in June of this year," he said. "But clearly they were contracting to do road work long beforehand, so that means essentially the city had been contracting to do work that it not yet had permission to do." While that may not be illegal, it's "likely not best practice," he said. "I feel there's certainly a risk to taxpayers' money." He said a civil injunction is not in the group's plans now but he asked members to contact the New Brunswick ombud to raise the timeline information. Biggs said the group is asking the city to halt all construction activity at the square and to develop a detailed plan after consulting with the public, including the Wolastoq people. City hall did hold consultation meetings with the public about Officers' Square between March 2016 and May 2018. A design of the park's master plan was also posted on the city's website. But Biggs said the plan presented to the public doesn't include any of the "devastating activity," such as cutting trees, changing the level of the ground or getting rid of the wall in the park. "These are character-defining elements of that square," she said. "When you remove them, they no longer are a national heritage site." She said the gravity of the situation about to unfold at Officers' Square wasn't clear to the public, or people would have spoken out a lot sooner. "It's very misleading and very deceitful," she said. "I don't think the public understood. I think there was a schism between what was presented and what's actually happening." The City of Fredericton will hold a public meeting on Tuesday night to share more information about the revamping of Officers' Square and for members of the public to share their concerns. During his address on the state of the city earlier this week, Mayor Mike O'Brien said the remodelling of Officers' Square was a well-researched plan that was endorsed by the downtown business network and city council. "The issue that came up is some people may be not happy with the overall concept of the plan," he said. "That's understandable."